Branches which I was using so far always used gloves, so depends on branch really. Also you can always complain. My nearest Pizza Hut is 35 minutes away. We don’t even have Uber (lol) I actually had ASDA’s stuffed crust on Monday and it was awful so I can definitely not recommend the stuffed crust. Pizza Hut always has deals. If you want lots of toppings (compared to Dominos) but not a fresh dough pizza then some Asda store pizza counters will cook for £1 extra. So £3.50 + £1 for 14" pizza cooked in a takeaway box and opposite Dominos where I live! The Asda staff wear gloves! Overly priced compared to where exactly? Perhaps where you live there’s loads of take aways which means there’s more choice of offers from different retailers. However other than basic listed menu offers, occasional just eat discount code and papa johns where I live in Scotland dominos have the monopoly. And I’m not complaining. I’m super impressed that you’ve visited every single branch to make such a statement? Not tht it applies to me, I love meat . Domino’s - Early Week Mega Deal! any pizza, any size for £5.99 until Thursday 4th April! Not available to older leave voters according to their CFO. Another brand boycotted. I've tried 6 or 7 places local to me and there's nothing. £5.99 is a cracking price if you can find it. Why have the mods changed it to any medium? Premium crusts and bases charged as extra per the OP. Pretty sure this is specific to your local. If you’re interested in the welfare of chickens so much, you’d stop going to KFC. Judging from your profile, that ain’t gonna happen. I feel your pain, they look so cute yet taste so heavenly! Non-halal chickens are always given a cuddle before they are, errr, slaughtered. Makes the whole thing so much more civilised. Even the chickens appreciate it. Ask them if you don’t believe me. Don't tell me it's nothing to do with B*%$!t.. Thanks, Edited to make it more clear that it's not in every location. You don't mention, but this deal is location specific! There is also a £19.99 Collection deal for 2 x Any Size Pizza + 2 x Sumptuous Size + 1.25 L Drink for £19.99 in some stores. Really appreciate your patronising but... Dough Puree Mozzarella Peppers Meat Onion etc. Whatever costs are incurred by a business, the ingredients above with cooking and delivery do not cost £16.99 - £20.00. There's a reason they consistently have £7.99 collection only offers. Because they can afford to "sweetie". Maybe we can try and get literate first? I think the deal has gone cold not offering me the cashback. Large Pepperoni Passion - Normal Price £19.99 Does anyone actually pay those full prices? Shocking but i bet theres some who do. i dont mind killing them though i like to torture them first..
Dominos Any size pizza £7.99 collection Or £10.99 delivered until 21/02/19. Or £10.99 delivered until 23.59 21/02/19. Cant just say "I was out of order" can you. Have to resort to well used, childish responses because you have no valid point. Ill stop responding as your clearly a waste of air and dont worry, we wont run into each at any parties. Definitely not the kind of person I'd mix with. Erm yes you did call people Jews in a negative way, thats why the comment has been deleted. Snowflake, highbrow and original response there. Its not about following a crowd, its about just not being needlessly offensive to other people. It's 2019, you don't have to follow the crowd and identify as a snowflake. Eat your crusts and get some hairs on that chest :p . Also I didn't call anyone a Jew at all, I merely pointed out that Domino's are very stingy via euphemism, which is absolutely true compared to the likes of PJ's and PH. Back yet again. Large pizza, garlic bread, wedges, cookies and a 1.25l bottle of drink for 19.99. Normally would cost you around £25+ depending on the pizza you order. Yeah it was cheaper last year. Indeed it does. My local store sometimes passes off cardboard as a thin crust base. 20 quid for cheese on toast? It’s on full price pizza’sdoesn’t work with any other special offers. Oh no, you just hurt my feelings. Today only. I’ve had a search on my phone for dominos and Wuntu and can’t see posted already. If it’s already posted, mod please delete. any spare codes please ? 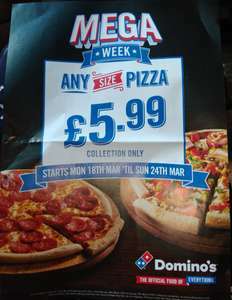 Never had a Domino's pizza before I got his offer a few weeks ago, rather nice I thought, and taken this offer a couple of times more. Can't believe folk pay for than £5 for these things normally though, let alone £10-£15. But for £3 this deal is nice and hot and tasty. Whoops (:I wasn’t that me? Perhaps it's one of those leaflets that you get with your post every week, I'm just hoping Gregg's do a repeat of last year's advent, remember it, think it had baby Jesus holding a sausage roll ! Just use code SALEWKND on any order over £30! You can disagree sure but that is the rule on here for such deals, non cashback price must be displayed. Else it is just baiting. Glad I'm not the only person confused! seems like a great deal but 2 downsides -its cashback over 2yrs and its vodafone. Dominoes is such a rip off, even with deals. Got to agree, I always opt for a decent one from a Supermarket now, cheaper too ! I do like an Asda create your own pizza.. It's not 9.99. It's 20 quid. Not try and con us!! If you think paying £10 is a high price for a delivered Pizza I suspect you don't have any economics qualifications. I do have to wonder what is this almost fetish like concern by some about people able and willing to spend £10 on a Hot Tasty Pizza that is delivered. People come out with comments like, it only takes 15 minutes or they're only £4 in Tesco/Sainsburys/Asda/et al... These, what I would categorise as 'Passive Aggressive' comments, are really just quite silly in my honest opinion, It's been a long time since I had to worry about spending £10 on anything and whether it would have any impact on my quality of life. Sometimes, if you come home, don't have anything in and it's been a long day, the simple convenience of being able to collapse into a chair without even having to think about stuff is very appealing. Notwithstanding the above, why do you care? Do you really have so little going on in your own life that you need to spend time, like some self righteous deity worrying about how others spend their money? I'd be interested in knowing if any of these price focused culinary experts smoke or drink or have Sky TV or perhaps a whole list of other things if I put my mind to it. This is supposed to be a price saving site, if you know of a better deal for a single, delivered, quality Pizza great tells us all, else why are you even in the thread? Id say 15 mins. Either way is faster than waiting for a delivery. Dominos 2 for 1 Medium or Large pizzas using code 241PIZZA. Nope, doesn't work. This deal is completely invalid. Add the 2 pizzas, at checkout enter code 241PIZZA all capitals and no spaces. Working fine for me still, so don't think it should be deleted. Please delete. "Oh dear, this voucher is invalid. Please try again." Worked for me. No hassle. Delivered in 25mins..have some heat man..
Can someone get one for me... Dread to intentionally set foot in Coventry. You have your phone on vibrate and you're putting your thumbs up where? Don't answer that. Domino's Pizza is a fixture on high streets all over the UK. From Thurso to Falmouth, almost every small town has a Domino's just waiting for customers to call or order online. In fact, with around one quarter of the UK's market share, Domino's is right up there with Pizza Hut and Papa John's. If you adore what Domino's have to offer, price can often be a problem. Takeaway pizzas may be satisfying, but they don't come cheap unless you take advantage of vouchers and money off deals. There are over 700 Domino's stores in the United Kingdom. You can also access the world of Domino's online at their website at www.dominos.co.uk and find your nearest branch of Domino's Pizza by using their online Store finder. Just enter your postcode and hit "Go". The Domino's story began in a small town called Ypsilanti, Michigan way back in 1960, when brothers Tom and James Monaghan bought a neighbourhood pizza parlour. The restaurant had been known as Dominick's before the takeover, and the Monaghans wanted to keep the brand, but the previous owner insisted the name be changed. When a delivery driver suggested using Domino's instead, a legend was born. In 1967, Domino's adopted a franchise model, which kickstarted their corporate expansion. By 1976, there were 200 outlets across America, they opened their first foreign outlet in Canada in 1983 and then in Japan in 1985. That same year, Domino's reached another milestone, when the first British location opened in the Bedfordshire city of Luton. In 1993, the number of UK stores had expanded to 73 and the US parent company hived off the business to another pair of brothers, Colin and Gerry Halpern. Wales and Scotland were added to the Domino's map by 1997, and the chain entered into a famous partnership with the Simpsons in 1999. Since then, they have continued to develop, introducing special insulated carry bags to keep their pizzas extra fresh as well as innovations like extra low fat Mozzarella. With the number of Domino's stores passing 600 by now, there will be a restaurant near you. And with internet and smartphone ordering available, it's never been easier to order a freshly cooked pizza. How are Domino's Pizzas Made and What Goes into Them? What exactly is the secret of Domino's success? Well, you can't really look far beyond the food itself. Something about their mass-produced pizzas has caught the imagination of diners in the UK. In a typical Domino's the restaurant will make up the day's supply of pizza dough in the morning, and ensure that a plentiful supply of sauce and toppings has been ordered via the company's supply chain. After that, it's just a matter of rolling out evenly sized bases for every customer order, then adding the right variety of toppings. At Domino's this includes sauce made from vine ripened tomatoes, Mozzarella cheese and toppings that enable customers to create a massive 100 million different types of pizza. Domino's: What's on the Menu? Pizza – A range of speciality pizzas including simple classics like cheese and tomato, Chicken Feast and the New Yorker, as well as Domino's trademark specials like Meateor, Domino's Tandoori Hot, and Pepperoni Passion. Browse all, or choose just the vegetarian or hot and spicy option. Each pizza can be customised just to your taste. Sides – A whole host of extras for when pizza just isn't enough. Including potato wedges, garlic pizza bread, dough balls, coleslaw, dips and chicken wings. Desserts – The pizza delivery experience just wouldn't be complete for many without something sweet to finish off with. Including chocolate brownies, Domino's cookies and various flavours of Ben & Jerry's ice cream. Drinks – A range of soft drinks to wash down your meal. Including Dr Pepper, Fanta, Coca Cola, Monster Energy and bottled mineral water. Wrapzz – A selection of Domino's pizza toppings in the form of a wrap. Including Vegi Supreme, Pepperoni Passion, Tandoori Hot and Meatball Feast. What Types of Pizza Can You Buy From Domino's? Domino's offers four sizes of pizza. Large pizzas measure 13.5 inches across, while medium sized pizzas have a diameter of 11.5 inches. Beyond that, you can also order small 9.5 inch pizzas and “personal” 7 inch pizzas – so there should be something to suit your appetite. Sicilia – With chicken breast strips, mozzarella, pepper pearls, Cajun seasoning and red onions. Roma – With mozzarella, rocket, red onions, goats cheese and pepper pearls. Mexican Fiesta – With mozzarella, green and red peppers, Mexican chicken, red onions, sour cream and paprika drizzle. Mighty Meaty – Featuring mozzarella, Cumberland sausage, ground beef, ham, pepperoni, mushrooms and red onions. Vegi Supreme – Featuring mozzarella, green and red peppers, mushrooms, red onions, sweetcorn and extra tomato. American Hot – Featuring mozzarella, jalapeno peppers, pepperoni and red onions. Hawaiian – Featuring mozzarella, pineapple, ham and mushrooms. Tuna Delight – Featuring mozzarella, tuna, sweetcorn and red onions. Domino's Tandoori Hot – Including mozzarella, green and red peppers, red onions, mushrooms, jalapeno peppers and tandoori chicken. As you can see, there's plenty to choose from at Domino's. But that's really just the tip of the iceberg. You can also create your own pizza using a wide range of toppings including: smoked bacon rashers, chicken breast strips, garlic butter, barbecue sauce, olives, pork meatballs, anchovies, Domino's herbs and green chillies. That should make it easy for vegetarians and meat lovers to create meals that tickle every single one of their tastebuds. What Sides and Desserts Do Domino's Sell? Meltin' Meatballs – Mini pork meatballs topped with melted mozzarella cheese. Italiano garlic bread – Crispy pizza base topped with mozzarella and garlic. Caesar salad – A classic Caesar salad with croutons, olive oil, Italian hard cheese and a smoked garlic dressing. Potato wedges – Classic wedges served with a delicious dip. Nachos – Corn nachos served with melted cheese and salsa dip. Chicken strippers – Fried chicken strips coated in breadcrumbs. Chicken kickers – Fried chicken bites covered in a crunchy, spicy mix. Chicken wings – Fried chicken wings coated in barbecue sauce. Coleslaw – The popular carrot and cabbage salad with a rich mayonnaise sauce. Dough balls – Delicious baked dough balls filled with pepperoni or cheese. Chilli infused oil – A great addition to pizzas and sides, Domino's chilli oil gives any meal an extra kick. Dips – Add barbecue, red hot or garlic dips to any order. Chocolate melt – A rich, decadent chocolate dessert with melted chocolate sauce in the middle. Brownies – An after-dinner classic featuring Belgian chocolate chunks. Cookies – Includes 4 chewy cookies loaded with chocolate chips. Ben & Jerry's Ice Cream – Domino's have had a long partnership with Ben & Jerry's and offer most of their varieties, including Chocolate Fudge Brownie, Peanut Butter Cup and Cookie Dough. Soft drinks – Domino's offers plenty of drinks to slake your thirst, including Coke, Diet Coke, Glaceau Smartwater, Fanta and Sprite. What Kind of Deals Do Domino's Offer? 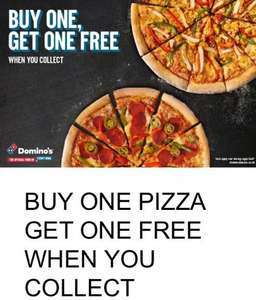 Domino's are constantly seeking to attract new customers via discount codes and combo deals. In fact, there are so many deals at any one time that the problem is trying to keep up, so we´re giving you a practical overview of all the current Domino's vouchers in a special listing here at hotukdeals. The online menu won't necessarily flag up special deals when you order, so customers need to stay alert and check for deals before they make a purchase. There is also a Deals section on the Domino's website where valid offers in your area are automatically displayed, and all you need to do is to click the “Create your deal” button to access them. There are a variety of different types of deals on offer. For instance, the “Two for Tuesday” deal offers buy one get free on large and medium pizzas; the Family Deal includes a large pizza, garlic bread, a chicken side and a 1.25 litre bottle of soft drink, while the Early Week Special includes a single large pizza with up to 4 toppings. Be careful to pick the best deal. Group deals area particularly good way to make bigger savings, but with a range of group deals on offer, it's not always easy to work out which one offers the biggest savings. Is Domino's Appropriate for Vegetarians and Vegans? Domino's offers a wide variety of pizzas that are suitable for vegetarians and people on gluten-free diets, and these options are clearly signposted on their menu. However, Domino's admits that their pizza bases include milk extracts in their recipe, making even cheese-free menu options unsuitable for vegans. Then again, if you can't eat dairy there are side dishes like potato wedges which might fill a hole. Domino's should also be fine for halal diets, but there are some exceptions. All of their chicken products are certified as halal and come from suppliers in Thailand. That's apart from their chicken wings, which are sourced from European companies who do not adhere to halal guidelines, so Muslim customers may want to give them a miss. Are Domino's the Best Value Pizza Chain in the UK? There's no doubt that Domino's pizzas are tasty and, when you use their discount codes, pretty cost effective, but do they offer the best value for money for UK shoppers? Actually, Domino's tends to come out among the more expensive pizza companies before deals are applied (a reason why you should always check the hotukdeals listings before you buy). Then again, they are comparable with major competitors like Papa John's and Pizza Hut, so if you are looking for a standard pizza, buying from Domino's won't leave you too out of pocket. You can save money by purchasing ready-made pizzas from supermarkets like Sainsbury's and cooking them at home. This may defeat the purpose of ordering a takeaway, but it's a reasonably cheap way to get your pizza hit, if you absolutely need some tomato sauce, mozzarella and crispy baked dough. It might also be worth checking hotukdeals merchants like Just Eat or Hungry House. These sites bring together all of the small pizza chains in local areas, making it easy for customers to order from them. Smaller chains often charge less than companies like Domino's, and although the quality varies, they can cook exceptional pizza. If you can't wait to order a pizza from Domino's there are a number of ways to do so. Give them a call – If you know the number of your local Domino's you can phone in an order directly. If you don't know it, just use Domino's Store finder tool which will show all of the contact information for Domino's outlets in your neighbourhood. Order online – If you are at your computer and want to order in a pizza the best way to do so is by logging onto the Domino's website at dominos.co.uk. The site will ask you to supply your postcode and then connect you to your closest Domino's restaurant. Not all Domino's have the same menu options, but the site will show you exactly what is on offer. Just pick the pizzas and sides you require, specify the right size and proceed to payment. You'll need to create a Domino's account in the process, but this doesn't take long. When you've signed up, you'll also receive regular updates from your local Domino's about new deals and meals, so it's worth the time. Use the Domino's app to order on your smartphone or tablet – Mobile users can order their pizza wherever they are, which is handy if you are out in the park or on your way home. The app can be downloaded for iOS and Android devices. Facebook Messenger – You can also submit Domino's orders via your Facebook account. To do so, create a Domino's account on their website and go here to set up an “Easy Order”. When that's done open Facebook Messenger and message the word “pizza” to a contact called “DOM the pizza bot”. You can pay at Domino's Pizza using three different methods: Cash, PayPal, Debit or credit card (Maestro, Visa Delta, Visa and MasterCard). Domino's Pizza delivers to most parts of the UK. There may be a minimum spend amount, but due to the franchise nature of the company, this can vary from store to store. See online for details. When you type in your postcode at dominos.co.uk, the site will tell you which, if any, branches deliver to your home. You can keep track of the status of your order, step by step, using the Pizza Tracker on the app or the confirmation screen. While the company strives to make its deliveries on time, should any unforeseen circumstances occur, and your order will be delayed, you will be informed. If you need to make a change to your order or wish to cancel the order completely, you should call the store from which you made the order. Bear in mind that, legally, this must be done within a reasonable time. In the case of perishable products such as delivery food, this usually means within a matter of a few minutes after making your order. In the case of a successful cancellation, if you've already been charged, Domino's will refund the money back the way it was paid. In the case where a cancellation is made after the food has already begun to be prepared, you have no further right to a refund. Call your local Domino's to discuss it and arrange a refund or a replacement. You can then either return the pizza to the store or wait for a delivery driver to collect it. If you're still not satisfied with the store's response, you can contact the Customer Service team using the contact information further down this page. Like most large companies, Domino's maintains a relationship with its customers through social and digital media. Following the various channels is a great way of finding new and exclusive deals and offers on orders from Domino's. 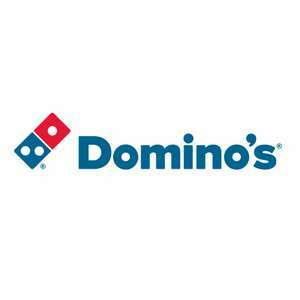 You can also follow the Domino's blog, for the latest news, vouchers and deals. Domino's Pizza customer service team can be contacted through all the usual channels. Nothing beats a pizza covered in your favourite toppings. It's the perfect food for watching football, enjoying movies with friends or forgetting about the stress of work. Domino's is one of the best places in the UK to order pizza, and you can do so for less with the offers to be found at hotukdeals.